When it came to pure speed and “catchability,” Rick Owens was your guy. Only his older brothers, Herb and John, were in his league. He played football under Harry Gamble and Tom Curley and starred as a wide receiver and defensive back. In track, he was a great sprinter and twice the Group III high jump champion. “We won the Colonial Conference one year and were competing at a time when there many good teams in the conference,” Owens said. But it was basketball that gave him the most publicity in high school. “We had six guys who averaged double figures and John Kling was the basketball coach,” said Rick. “We won Audubon’s first and only state championship and we really blended as a team – on defense as well as offense. 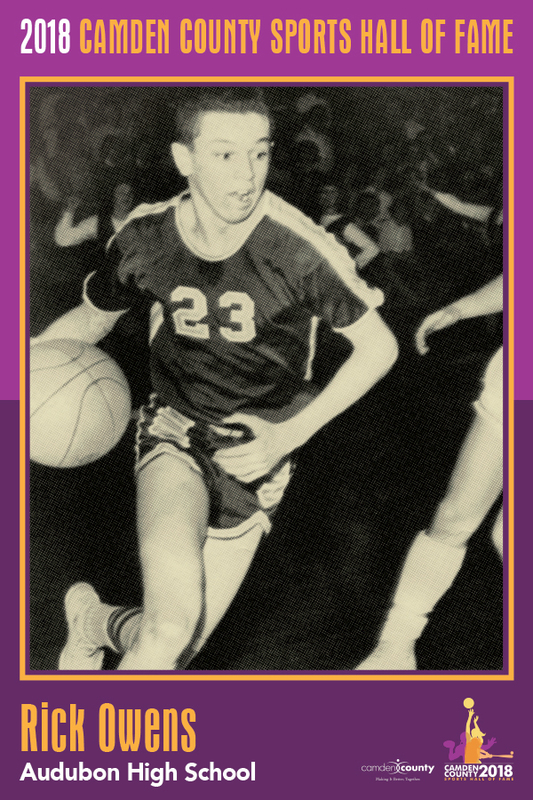 We also had the quickness to make Kling’s fast break go.” Rick could have mentioned that he was an All-State Group III choice as a senior and junior and an All-Colonial pick as a junior. Owens had the grades, too, to be admitted to Penn and play football and track there as a skinny kid. He was a member of the Quakers’ only undefeated freshman football team (coached by John Cervino of Haddon Heights). Moving up to the varsity for the next three years, he led the Ivy League in pass receiving and punt returns and set a one-game record for receiving in the Ivy League. Moving over to track, he regularly clocked the 100-yard dash in 9.8. He won the Ivy League championship in both the 220 and 440 and became Jim Tuppeny’s first IC4A champion in 1967. He also was the Metropolitan IC4A champ that year. And he concluded his years at Penn by being drafted by the Oakland Raiders of the NFL. Owens has built a successful career as a financial counselor and took up the sport of golf. Naturally, he excelled in golf and met his wife, the former Judy Steele, who had carved her own Hall of Fame athletic figure at Collingswood High. She had excelled in hockey and tennis in high school and went on to be a good hockey player at West Chester State. Rick and Judy hadn’t known each other when they were Colonial Conference rivals, nor in college. But they met when they were teeing it up on consecutive foursomes at Riverton. “We had some time to talk on the golf course and the next thing we were dating and married,” Judy Owens reflected. Judy kept up with golf and was a 12-time club champion on a course near their home. Rick doesn’t play nearly as much these days, but still carries a 10-handicap as a part-timer. Their son, Brian, is a scratch golfer who played on the team at Penn. Their daughter, Brooke, was a club soccer player at Princeton, but made her mark as a lacrosse All-American. She then went to Penn to study veterinary medicine and is now a practicing vet. Quite a family, the Owens!